This weekend, many of us will be making our final grocery list for the big Thanksgiving meal. 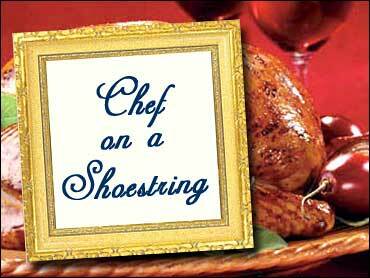 But if you haven't figured out your menu yet, don't fret, because cookbook author David Rosengarten shared a great and easy menu for our special holiday Chef on a Shoestring challenge. If you're looking for fancy, stacked food with gourmet ingredients, David Rosengarten's latest cookbook, "It's All American Food," is not for you. The book, Rosengarten writes, is "a book about what we eat in America and everything that we remember eating. It revisits and reinvents all those foods from our grandmothers' kitchens that we once found mildly embarrassing. For some time now, happily, we have been returning home, discovering not only the potency of American regional and home cooking of the past but also the unexpected foods that have arrived on our shores over the past hundred years -- and will be shaping the way we think about American cooking for some time to come." Rosengarten continues to say that he wrote his book with the intention of discovering America all over again. He says he had to look at the American table in "unaccustomed ways." This book, he says, is a panoply of everything, from regional cooking to Cuban-Chinese dishes because so-called exotic dishes have become a part of American dining choices. "It's All American Food" is divided into three main categories: Ethnic America, Regional America, and Classic America. With 400 new American classics, The Saturday Early Show thought Rosengarten was the perfect guest to create a delicious Thanksgiving meal with our entertaining budget of $60 for six people. Rosengarten's menu: Two-Stage Roast Turkey with Southwestern Honey-Pepper Rub; Smoky Chipotle-Mushroom Gravy; Scalloped Potatoes with Ham; and for dessert, Southern Banana Pudding. Chipotle (pronouncer: chih-POHT-lay): Chipotle pepper is a hot chile that is actually a dried, smoked jalapeno. It has dark brown skin and a smoky, sweet flavor. Chipotles can be found dried, pickled and canned in adobo sauce. Rosengarten used chipotle pepper in adobo sauce for the gravy. The following recipes are from "It's All American Food." Excerpted by permission of Time Warner Book. No part of this excerpt may be reproduced or reprinted without permission in writing from the publisher. Some years ago, I had the pleasure of speaking with Alain Ducasse, arguably the best-known, most highly respected chef in France today, during one of his first visits to America. He wanted my dining recommendations for New York City. Rather than give him the address of a fancy restaurant, I decided to pick him up, drive him out to Queens, and sit him down at a dive called Pearson's Texas Barbecue before a plate of Southern barbecued ribs. He wasn't mildly impressed; he wasn't merely being polite. He sat there beaming, licking the barbecue sauce off his fingers, muttering, "Je l'adore, je l'adore!" This is a book about what we eat in America and everything that we remember eating. It revisits and reinvents all those foods from our grandmothers' kitchens that we once found mildly embarrassing. For some time now, happily, we have been returning home, discovering not only the potency of American regional and home cooking of the past but also the unexpected foods that have arrived on our shores over the past hundred years -and will be shaping the way we think about American cooking for some time to come. I set out to write this book with the intention of discovering America all over again. To do so, I had to look at the American table in some unaccustomed ways. For the real subject of this book is not the usual cookbook fare, nor is it the idealized fantasy food of a photostylist's imagination. Rather, it is the vital, almost invisible American food that is eaten every day from the bayous to Boston, from east Texas to the shore of Lake Michigan, from Biscayne Bay to San Francisco Bay. This book not only includes the panoply of traditional regional cooking, and Mama's comfort classics, but also embraces the mongrel cooking of our endlessly hyphenated romance with ethnic food. From Italian-American to Cuban-Chinese -and not usually in fancy restaurants! -what we eat has been enlivened by the influence of the corner deli, the corner takeout, and those who, newly arrived in America, struggled to make sense of our ingredients. Most important, this book focuses on what Americans really like to eat - which isn't often celebrated. Not too long ago, I was a judge at a chef 's competition in Reykjavík, Iceland. At the start of the competition the judges followed the chefs through a large, very bright, American-style supermarket in the ingredient-gathering phase of the event. As we left the store, I noticed that another judge, Pierre Hermé, had bought some groceries. Hermé is justifiably considered the pastry and chocolate god of Paris. "You bought something," I said, somewhat curious. "What is it?" I inquired. "Hellmann's mayonnaise?" I repeated, somewhat startled at the thought. "It is the best," said his wife. "As good as the mayonnaise you make at home?" I asked. "Much, much, bett-AIR! We cannot find it in France, so we buy a lot wherever we can." If this was a surprise to me, imagine what a shock it would be to many American foodies! I am certain that were they to host the Hermés at their home, out would come the mixing bowl, the whisk, the egg yolks, the Provençal olive oil, and a half hour of vigorous beating and emulsifying would ensue. Pierre is a gentleman. You would never know how disappointed he was. Why must we feel guilty about using crowd-pleasing convenience products? We use them in cooking for ourselves, but when company is expected, out comes the Cuisinart. Does it really make sense to jump through contorted gastronomic hoops to impart a small bit of fresh garlic flavor to a sauce when you can simply sprinkle on a little garlic powder? Let your taste buds find the difference. Imagine how your mother, and your grandmother, must have welcomed these products, how liberated and modern they felt, and if they were immigrants, how American they must have thought themselves to be! Why put yourself back into kitchen drudgery? Used properly, these ingredients are among the elements that made this country's cooking great. This new recipe includes a technique I've been using for years: roasting the turkey in two stages. I do this because of the Big Turkey Problem: while you're waiting for the turkey's dark meat to cook (which takes longer), the white breast meat dries out. My solution: cook the bird until the breast is still juicy, remove the bird from the oven, and carve off the two sides of the breast. Put the bird back in the oven -- and while the dark meat's finishing, serve a white-meat first course. Twenty minutes later, you can serve a dark-meat second course. And you get to drink two wines with this main course: I always like to serve a white wine with the white-meat course and a red wine with the dark-meat course. By the way: the honey-pepper rub burnishes the big bird beautifully. Prepare the rub: Melt the butter in a small saucepan. Pour butter into a large mixing bowl. Add pepper, cumin, oregano (pulverizing it with your fingers), chili powder, garlic powder, cinnamon, clove, and salt, mixing well. Drizzle in the honey and blend well. Remove turkey from oven and (at table, if desired), remove the large breast fillet from each side of the turkey. Let the fillets rest a few minutes before carving into slices. Meanwhile, return the rest of the bird to the 325 degrees F oven. Cook until the dark meat reaches 175 degrees F, about 20 minutes more. Remove, let rest a few minutes, and serve. I love this deep, smoky sauce with the turkey -- but it's also terrific with other long-cooked meats. If you had, say, some leftover pot roast in the fridge -- a second-day reheat with this sauce will probably be better than what you ate the first day. Submerge the dried mushrooms in 1 cup of hot water. After 20 minutes, strain the soaked mushrooms out. Reserve both mushrooms and liquid. Meanwhile, place the bacon in a large pot over medium-high heat. Sauté for 2 minutes, stirring. Turn heat down to medium and add the garlic. Sauté for 1 minute, stirring. Over sink, squeeze the tomatoes in your hands into a strainer until most of the juice has run out. Chop the tomatoes and add to the pot. Add the chipotles in adobo sauce, making sure the chipotles are cut into small pieces (some cans may contain whole chipotles, some may contain chopped chipotles). Add the barbecue sauce, the reserved mushrooms, and the reserved soaking liquid. Bring to a boil, then lower heat and simmer for 10 minutes. When ready to serve, turn heat off and whisk in the butter to velvetize the sauce. The canned-soup-with-stuff casserole in general became an American classic in the early part of the twentieth century, thanks to the recipes created and publicized by the Campbell Soup Company. In 1955, Campbell hit the jackpot -- creating the most popular casserole of all time, the classic Green Bean Bake, made with Campbell's cream of mushroom soup and topped with fried onions from a can. Things don't become classics because they're bad -- and the combination of ingredients in this dish is really quite delicious. That's not to say that a tweak or two can't improve it. Try the following version with fresh-fried shallots and dried tarragon thrown into the mix. It's irresistible! This version respects the fifties taste but is so much brighter and more layered in flavor. The soy sauce, by the way, was part of the original recipe. Bring a pot of salted water to a boil. Add green beans and boil for 3 minutes. Drain beans and immediately plunge into ice water to stop the cooking. Drain well, and set beans aside in a 9 by 13-inch baking dish. In a large saucepan, bring 2 inches of vegetable boil to 365 degrees F. In a medium bowl, combine flour and paprika. Season with salt and pepper. Place shallots in the bowl and, using your hands, dredge lightly in the flour mixture. Tap off the excess flour and place half the shallots in the oil. Fry until golden and crispy, about 1 to 2 minutes. Remove and drain on paper towels; season with salt and pepper. Repeat with remaining shallots. Melt the butter in a large skillet over medium heat. Add sliced mushrooms and cook without stirring until browned, about 2 minutes. Add mushroom soup, milk, water, lemon juice, soy sauce, and tarragon to skillet and whisk until smooth. Bring mixture to a simmer, pour over green beans, and stir to combine. Add half the shallots and stir again. Bake until sauce bubbles, about 30 minutes. Top evenly with remaining shallots and bake 5 more minutes. Serve immediately. When it comes to potato casseroles, the French get most of the accolades; their creamy potato gratin is certainly worth the international attention it gets. But there's a lot to be said for its American cousin, too -- scalloped potatoes. In fact, the following recipe, I'm convinced, could go spud to spud with the French classic in any competition. It is homey, heartwarming, bursting with potato flavor, seasoned perfectly, graced with the wonderfully complementary flavors of ham and cheese. And there's this amazing advantage -- it has a kind of lightness to it, so you can enjoy a lot more of it than you can the creamy French gratin. Preheat oven to 375 degrees F. Generously grease a 9-by 13-inch baking dish with the butter. In a small bowl, combine flour, thyme, salt and pepper. In a medium saucepan, bring chicken stock and cream to a simmer; whisk in mustard and remove from heat; set aside. Place one-third of the potatoes in an even layer in the baking dish. Sprinkle with half the flour mixture, one-third of the cheese, and one-third of the ham. Repeat with another layer of potatoes, flour, cheese, and ham. Make a final layer of potatoes, cheese, and ham. Pour cream mixture over and sprinkle with bread crumbs. Place in the oven and bake until potatoes are easily pierced with a knife, about 1 hour to 1 hour and 10 minutes. If top becomes too brown before potatoes are cooked through, cover with foil and continue baking. The option most home chefs choose is the store-bought can of bread crumbs, plain or seasoned. I dislike this option; these crumbs often lead to heavy, pastry coatings without any magic in flavor or texture. The only store-bought crumbs I love are panko crumbs, a Japanese product that you can buy in Asian grocery stores. The crumbs are light, puffy, shot through with air -- and when used for coating deep-fried foods, they make miraculously light and crispy exteriors. The only problem with panko crumbs is that they won't seem traditional. I have, however, found a way around this: if you crush the panko crumbs between your fingers, you'll get less of that frilly Japanese feel. The result when you use these crushed panko crumbs is much closer to the results of using regular crumbs -- and much, much better than any other store-bought crumbs. The bet option of all, in my opinion, for most dishes -- unless you're trying to get that frilly panko coating -- is to make your own bread crumbs at home. Here's a great recipe that's very easy to do. Cut bread (with the crust on) into 1-inch cubes and lay them in a single layer on 2 large sheet pans. Bake for 30 minutes. Turn oven off but do not remove sheet pans. Leave bread cubes in oven for 1 hour more. Remove from oven and let them sit until dried out (about 3 hours). Working in batches, place crumbs in work bowl of food processor. Process until fine. Use soon, or wrap tightly and freeze. For its amazingly high pleasure-to-work ratio, this dessert has most others beat. It is a totally unfashionable vestige of the old South, the kind of dessert you might find at those wonderful cafeterias: banana slices layered with a vanilla custard, vanilla wafers, and meringue. The way these ingredients fall together into a dreamy, creamy, utterly seductive whole is simply astonishing. Now, you could work a lot harder on this thing -- by making your own custard, even making your own vanilla wafers. But the following recipe -- given to me by a friend from the South whose family makes it all the time and calls it nanner pudding -- beats any hard-work "gourmet" version I've ever tried. So break out the Nabisco wafers and the Jell-O -- and remember that cooks should be judged only by how good their cooking tastes. Line the bottom and the sides of an 8-by-8 by 2-inch baking dish (about 2-quart capacity) -oven safe and nonreactive - with a layer of the vanilla wafers. They should just cover the bottom of the dish. Prepare the vanilla pudding according to the pudding directions on the package (you will need the 4 cups of milk to do this). While the pudding is still hot, stir in the nutmeg; set the pudding aside to cool for 5 minutes (but no longer). Peel 2 of the bananas and slice them into rounds that are 3/8 inch thick. Top the layer of cookies in the bottom of the dish with the banana slices. Top the banana slices with a second layer of vanilla wafers. Peel the remaining 2 bananas, slice them into rounds that are ⅜inch thick, and distribute them evenly on top of the second cookie layer. For the final layer, top those bananas with another layer of cookies. Pour the still-warm pudding over all. Shake the dish carefully, and tap it on the counter, to remove any air holes within the layers. Make the meringue. Add the egg whites, sugar, vanilla extract, and lemon juice to the medium-size bowl of a standard kitchen mixer with the whisk attachment. Whisk the mixture on medium speed until it just holds a peak. It should be light and fluffy; do not overmix it. Place the pudding on the top rack of the oven. Bake just until it is nicely browned on top, about 3 minutes. (It can burn very easily, so watch it carefully.) Remove the pudding from the oven and let it cool down for 1 hour on the countertop. Then place in refrigerator and chill for at least 3 hours, but not more than 5 hours.